Starwood has launched a new up to 50% off promo that comes with double Starpoints for stays in Australia, New Caledonia & Fiji. You must book by Augst 30, 2014, and stay by December 29 to be eligible for the bonus points. Note that you must book one of the rate plans mention on the above site to be eligible for the double Starpoints. The eligible rate plans are DAILY10, SPRRM10, DAILY1B, SPRRM1B, DAILY20, SPRRM20, DAILY3B, SPRRM3B, DAILY25, SPRRM25, DAILY4B, SPRRM4B, DAILY30, SPRRM30, DAILY5B, SPRRM5B, DAILY35, SPRRM35, DAILY6B and SPRRM6B. The double Starpoints rate may require you to book a stay of more than one night. Note that it says up to 50% off but the maximum discount varies by the property and can be less. You are often requried to book a stay of minimum of 6 nights. Some of the Australian hotels have the double Starpoints rate loaded for stays of one night that could suit business travelers. Has the Australian hotel market soured? Starwood is again offering bonus points for bookings that they tend not to do unless they must. 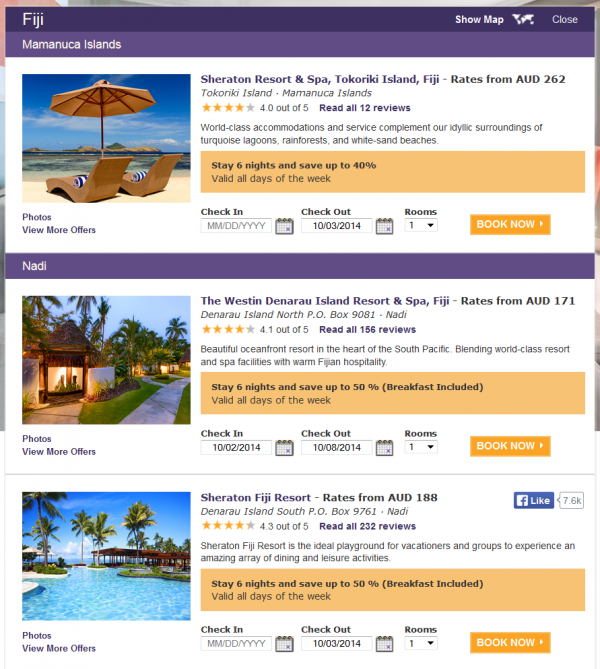 Offer is valid for stays booked between 14 July and 30 August, 2014 and completed between 14 July and 29 December, 2014 at participating Starwood Hotels & Resorts in Australia, New Caledonia and Fiji. Double Starpoints will be awarded per paid eligible stay on rate code DAILY10, SPRRM10, DAILY1B, SPRRM1B, DAILY20, SPRRM20, DAILY3B, SPRRM3B, DAILY25, SPRRM25, DAILY4B, SPRRM4B, DAILY30, SPRRM30, DAILY5B, SPRRM5B, DAILY35, SPRRM35, DAILY6B, SPRRM6B only and will be credited to the member’s account within 4-6 weeks of the stay posting to the member’s Starwood Preferred Guest account. Must be a member of Starwood Preferred Guest to receive Starpoints. Enroll for free atwww.spg.com.